Pssssst. Over here. Don’t say it too loudly, but it looks like spring has arrived. And you may agree that it hasn’t come soon enough. After four nor’easters in three weeks, the last of which swept into the region on the first full day of spring, many in the Hudson Valley are beyond ready for clear skies and comfortable temperatures. Get ready, gear up and lace up those sneakers and hiking shoes. The moment has arrived to stretch those legs, take a deep breath of fresh air and soak in the beauty of the Hudson Valley. So long, cabin fever. Hello, spring. Walkway Over the Hudson State Historic Park is a former railroad bridge across the Hudson River that connects Poughkeepsie to the Town of Lloyd in Ulster County. At 1.28 miles long, the span is the longest elevated pedestrian bridge in the world, according to the state Office of Parks, Recreation and Historic Preservation. And it offers a singular opportunity to walk, jog, bike, push a stroller or just chat with friends and family while enjoying sweeping, stunning views of the Hudson River and the valley that surrounds it. 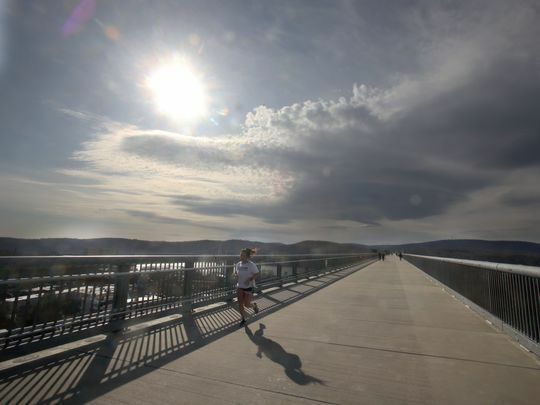 Walkway Over the Hudson will turn 10-years-old in 2019 and its ability to draw visitors continues to grow.